Kirkby Stephen: Black Bull, King's Arms, Pack Horse. Kirkby Stephen: Easter Monday, Tuesday after Whitsunday, Oct. 29, black cattle, sheep, and flax. Kirkby Stephen / At Kirkby Stephen, on r. a T.R. to Richmond. ... In 1774 was found in the peat pits near the town [Kirkby Stephen], two feet below the surface, a copper vessel, eight inches diameter at bottom, 14 at top, and 16 inches in the widest part just under the neck, depth 18 inches, containing about eight gallons and a half, made of three distinct plates, and much used in fire: being very slender it has six copper fillets at equal distances reaching up the sides two inches and a half, and turned over as much at bottom, which serve to support it, and it has within two ears with moveable rings, the whole of elegant workmanship. ... The Roman road is easily traced from Ribchester ... to Overborough; afterwards the Roman road goes through Casterton and Middleton, and, as some think, by Borrow-bridge and Orton, to Apulby. Others, and perhaps from better reasons, are of opinion, the road went by Sedbergh, or Sedburgh,  over Blewcaster, along Ravenstonedale-street, and through Kirkby-Stephen, to Brough or Burgh. KIRKBY STEPHEN / Chayter Esqr. 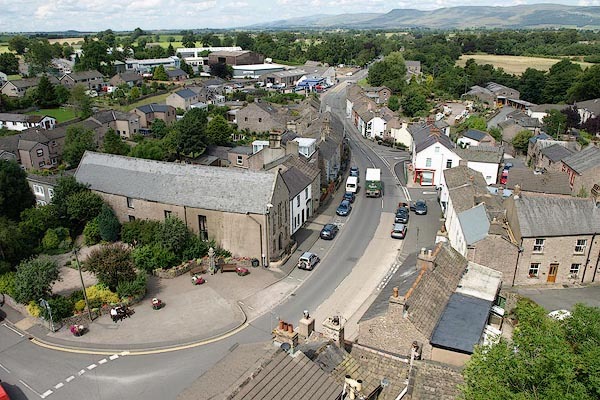 Kirkby Stephen, or Stephen's Church, on the River Eden, is one of the Towns of this County noted for weaving Yarn Stockings, and a Free-School founded and endowed by the Family of Wharton. Its Market is on Friday, and Fairs are on St. Mark's and St. Luke's, and Whit-monday. Kirby Steven Market Friday, Fair Whitsun-monday. 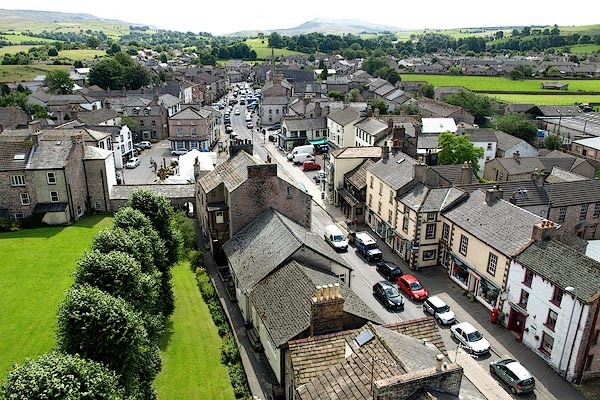 The upper, or northern part of the county [Westmorland], has two manufacturing towns, called Kirkby Stephen, and Appleby; ... neither of them offer any thing considerable to our observation, except a great manufacture of yarn stockings at the former. Friday market granted by Edward III to Roger de Clifford, 16 October 1353; listed in the Calendar of Charter Rolls. Letter patent for a market at Kerkeby Stephan, 25,26,27 Ed 3, 1351-54, in Palmer's Index No.93 at the Public Record Office. Market day Friday given on Bowen and Kitchin's map, 1760. Photograph, halftone print, Street View, Kirkby Stephen, Westmorland, by Edmund Bogg, published by Edmund Bogg, 3 Woodhouse Lane, and James Miles, Guildford Street, Leeds, Yorkshire, 1898. Included on p.110 of Lakeland and Ribblesdale, by Edmund Bogg. Photograph, halftone print, A Bit of Old Kirkby, Kirkby Stephen, Westmorland, by Edmund Bogg, published by Edmund Bogg, 3 Woodhouse Lane, and James Miles, Guildford Street, Leeds, Yorkshire, 1898. Included on p.113 of Lakeland and Ribblesdale, by Edmund Bogg.